Our clients pay less in taxes by taking advantage of government loopholes. But it takes more than just learning about the hundreds of loopholes available to start paying less tax today. You also need to put these ideas into action — and that’s where we come in. You need a team of professionals you can trust to give you the best advice and develop your proactive tax strategy. Sancus Tax and Accounting is the trusted partner you can turn to for the guidance and support needed to reduce your tax burden. Tax laws aren’t fair. They’re written to favor people who make money a certain way - through businesses and investments, primarily real estate investments. The best way to pay less tax is to do what the government wants you to do. Why try to fight the IRS when it’s so easy to just follow the rules, make more money, pay less in taxes, and still sleep at night? It’s not how much you make that determines how much tax you’ll pay - it’s how you make it. Earned income (ie: wages and salaries) is the highest taxed income there is. Your Proactive Tax Strategy only works if you develop a custom plan for your own circumstances. Tax laws are constantly changing. To pay the least amount of tax legally possible, have periodic meetings with your Certified Tax Coach and make sure he or she is keeping current on the tax law changes. Your Proactive Tax Strategy only works if you act. The sooner you and your team put your customized tax plan into action, the sooner you'll put money in your pocket. Start with a brief interview with a Certified Tax Coach. We want to hear about where you are now, and where you want to be. We’ll ask several easy questions about your current situation and from that determine the best Proactive Tax Strategy program for you. You complete a brief Tax Questionnaire. You’ll outline your financial, business, and investment goals and about where your money currently goes. We’ll need copies of your past tax return and a little information on each business entity (S Corporation, LLC, Limited Partnership, etc) that you currently have set up. It’s all in the Tax Questionnaire and we’re here to help you if you have more questions. The more information you give us, the better job we can do. We analyze your information and develop a comprehensive Proactive Tax Strategy. This stage typically takes two weeks so there’s plenty of time to research the best possible options for you. Together, we schedule a phone call to review the details of your plan and to get your feedback. Typically, this call lasts about an hour. It’s packed with a lot of information, though, so we'll write up your customized strategy so you won’t miss a thing! 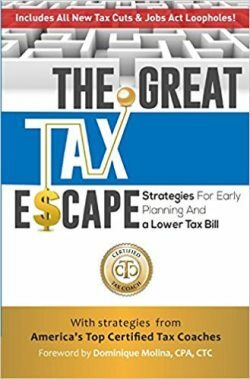 You get a write-up of your customized strategy along with informative tax loophole information based on needs identified during your phone call with your strategist. We conduct a follow-up phone call about two weeks after the initial phone call or meeting to cover the details of the first call again or to go through new questions you’ve uncovered. 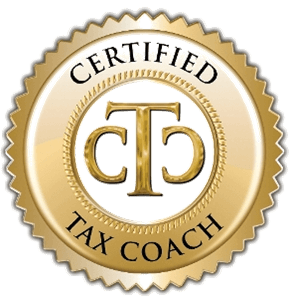 Find out how working with a Tax Coach will save you money.